Revenge is sweet. And surprisingly affordable. The 1998 comedy Dirty Work does work, but just barely. 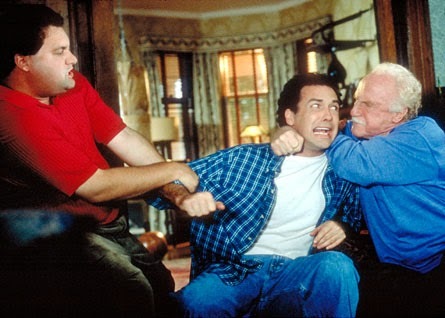 Co-written by star Norm MacDonald in his only real attempt at big-screen stardom, the movie combines the kind of absurd humor MacDonald is famous for with a lowbrow sensibility but jams them into a plot that's too formulaic. The jokes strain against the story; though it's an uncomfortable fit, the jokes do win out in the end. MacDonald stars as Mitch, a likable loser who can't keep a job down. When he finds out that "Pops" (Jack Warden), the father of his best friend Sam (Artie Lange), is actually his own dad as well -- and that Pops needs heart surgery -- Mitch has to come up with a plan to pay for the operation. Always gifted at exacting revenge on people, Mitch and Sam start a "revenge for hire" business (called Dirty Work -- see?) and end up getting taken by an evil businessman, played by Christopher McDonald. Because of course he is. Will Mitch blow his chances with a new lady (Traylor Howard) in whom he has taken an interest? There's nothing all that original about the plot of Dirty Work, though the "revenge for hire" business is a pretty inspired idea and leads to a few of the movies best gags (the funniest of which involves a prank gone bad and which goes on well past the point that any other director would have cut). But I tend to like comedies that make you feel like the filmmakers are getting away with something, and Dirty Work has just enough of that to warrant a recommendation. Apparently, there are supposed to be a great deal more of those elements in the movie; MacDonald and co-writer Frank Sebastiano (who would go on to co-write and direct Beer League with Artie Lange) wrote a very hard R-rated comedy, but MGM insisted it be watered down to a PG-13 when the movie was released in 1998. It didn't help, as no one went to see it in theaters. It wasn't until later on that the film's reputation as a cult comedy began to grow. That's unfortunate, as had it come out just a few years later there's a much better chance it could have gone out with an R -- or, at the very least, warranted an "unrated" cut on DVD. 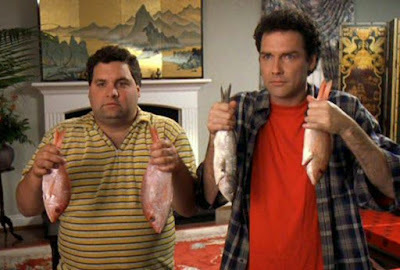 Given some of the talent involved, Dirty Work should probably be funnier than it is. In addition to MacDonald and Lange (who, unfortunately, is saddled with the role of straight man), the movie boasts appearances by Chevy Chase, Chris Farley (in one of his last roles, as an angry guy whose nose was bitten off by a prostitute -- it's a pretty unfunny joke that keeps getting repeated) and the great Don Rickles, playing the manager of a movie theater and getting some of the biggest laughs in the film (not surprisingly, many of his lines were ad libbed). The movie was even directed by a comedian: former Full House star Bob Saget. He proves a competent enough director (though hasn't really directed anything since), but adds little to the comedy -- he never finds a way to improve a joke through the filmmaking. It's the same brightly lit, point and shoot style found in a lot of late '90s and early 2000s studio comedy. It's rare that movie starring a comedian -- especially a first-timer like MacDonald -- actually has the same sensibility that makes that comic funny without simply transposing large sections of his or her act. In that respect, Dirty Work is a success...but only half a success, because while it's a funnier movie than it gets credit for being, it's still not a very good movie. Buy Dirty Work from Olive Films here. I unabashedly love this movie. It makes me laugh like few others, almost entirely due to Norm's odd cadence ("Mr. T? Are you telling me that you bet on the fight in Rocky III? And that you bet against Rocky?!"). While I appreciate that it's been given an upgrade to HD, I wish it was from anyone but Olive Films so that we could have had a chance to see some of the excised material. Either way, I'm just glad it exists. Norm's a really great comedian because he's so confident in what he thinks is funny, he doesn't care if no one else does. A few years ago he was on the roast of Bob Saget, and his whole set was nothing but clean language and corny jokes (this Bob, he's a real stinker). And no one laughed except Bob, and it's wonderful. Agreed, I loved that whole thing. "Ladies and gentlemen, this man is for the birds!" Haven't seen this probably since 98 or 99. I loved it back then. I love this movie and everyone in it. Give Beer League another spin if you haven't lately it holds up.